Ney Ricardo from our Surgeworks design team wrote a blog post few months ago that now became quite popular after it got featured on Smashing Magazine. 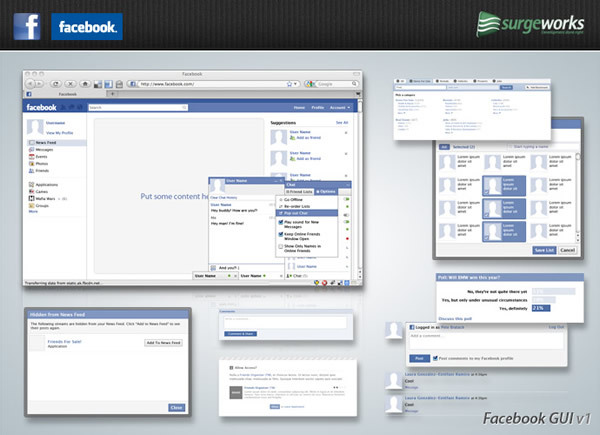 To make designers and developers life easier, Ney created a Facebook GUI PSD resource that is given to you for free. The purpose of this GUI kit is to speed up Facebook interface design, sparing you from drawing all the comps and letting you customize all the texts, buttons and data as you need. Is your website being hammered by Facebook and what liger has to do with it?